An expanding Coventry manufacturing business has unveiled its new £10 million headquarters which has helped complete the rebirth of one of the region’s most famous industrial sites. The Expert Group has created a new 75,000 sq ft design and manufacturing technology facility in Lyons Park and is set to expand its workforce by 40 in the next few months. The creation of the new building means that Lyons Park – which used to be Jaguar Cars’ Browns Lane plant – is now fully occupied. Expert Tooling & Automation’s new home – the Technology Centre – has brought its five premises in Coventry together under one roof. Twenty new jobs have been created in project management, mechanical engineering and electrical engineering by the move to take the number of employees in Coventry to 180 with an additional 40 jobs expected to be added in the coming months. Workshop facilities include an expanded CNC machining section, a dedicated robotic R&D area and manufacturing and apprentice training sections. There are also seven conference suites, four breakout areas and a dedicated customer engineering office for up to 26 engineers with audio and visual conference facilities. Managing director Angelo Luciano, who acquired Expert Tooling & Automation in 1998, started his career with Jaguar Cars in 1986. He said: “When I was 22, I worked at Jaguar Cars in Castle Bromwich and visited the Browns Lane site often so it seems fitting that Expert Tooling & Automation has become the final company to move to the site of its former factory. “Three of our previous purpose-built units were in Banner Lane in Coventry and we needed to expand to accommodate our increasing order book. “We’re developing technologies for lightweight electric vehicles including new joining methods for mixed materials used vehicle body structures consisting of composites and aluminium, and we’re also involved in the design and manufacturing of battery production lines. “Human collaborative robots will become more mainstream in the industrial automation sector with the expected changes in the employment market and the increase demand for further automation, these robots are designed to work alongside humans without the restriction of safety guards. Expert has more than extensive experience in this field and we were the first company to install a human collaborative robot at Jaguar Land Rover in 2017. Angelo said establishing a new headquarters underlined the company’s position as the largest manufacturer of assembly automation and robotic systems in the UK. Expert’s clients include Jaguar Land Rover, Aston Martin and Ford. West Midland Mayor Andy Street officially opened the new facility, and said it was fitting that it completed the development. He said: “This is a fantastic facility which will help to further establish Expert Tooling & Automation as the UK’s largest automotive equipment manufacturer. “Angelo and his team are to be congratulated on steadily building a successful business over the last 21 years and this impressive new headquarters will provide the platform for future expansion and job creation. 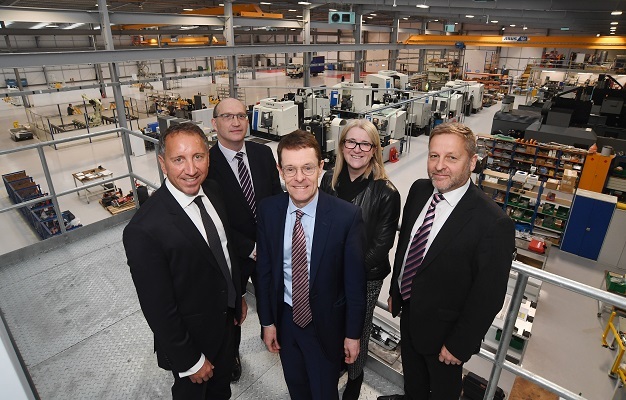 “The automotive supply chain is a key part of our regional economy which is why the West Midlands Combined Authority (WMCA) made a £2m loan available through Frontier Development Capital to help get this facility built. David Robinson from the Royal Bank of Scotland, Gerald Gannaway from Frontier Development Capital, Steve Collins from the Society of Motor Manufacturers and Traders and Paula Deas from the Coventry and Warwickshire Local Enterprise Partnership were among the invited guests.